Whether they’re howling at fire engines or hanging out in bars, coyotes have become a part of urban life. 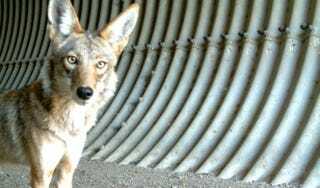 But a new study of LA coyotes by the National Park System has confirmed something that Angelenos have suspected for years: Coyotes aren’t just sauntering down our streets on their way to the local park. They actually live right here in our urban neighborhoods. The study looked at the location data from two coyotes that biologists had fitted with radio collars: C-144, a female in the Westlake neighborhood, and C-145, a male in the Silver Lake neighborhood. Although the team had studied many coyotes in Southern California, these two are the most urbanized so far. They’re so well-adjusted to city life that C-144 even casually crossed the 101 Freeway several times (although I will say there are at least two pedestrian passages along in this stretch of the freeway which would be very easy and safe for a coyote to slip through). In contrast, the subset analysis found 60% of C-144’s locations and 50% of C-145’s locations to be “developed.” Using the previous definition of “natural” as at least one square kilometer of natural vegetation, none of these urban coyotes’ GPS locations can be categorized as natural. Instead, they are considered “altered” landscapes, such as a dirt road or a vacant lot. I live in C-145’s neighborhood and I have to say we do have a fair amount of green space, so I’d always assumed the coyotes that I see on my block were living in a nearby park. Now I suspect they’re squatting in the vacant lot just down the street, where they’re thriving because of their proximity to my house. But I’m even more impressed by C-144. She’s living in one the most densely populated neighborhoods in LA—and she’s currently raising five pups there.